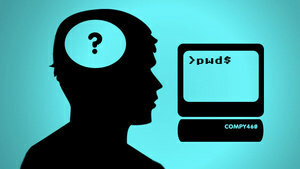 I was asked by many novices who struck with the most common and frustrating problems: forgetting Windows 7 password. Formatting is always an option to recover Windows 7 password, but we consider that a last resort. (Plus, guess who's going to prefer to reinstall all the lost programs after a wipe?) But all hope is not lost. There are a few ways to actually recover a forgotten Windows 7 password. Read on, and we'll show you the light. This would be the most traditional way to recover lost Windows password. With no technique requirement, no third party assistance, just calm down and think it over. You should put some serious guessing effort in everything in relation to the thing, the place, the person, and the time in your personal or professional life which may inspire your password. Your birthday or other special Memorial Day? The town where you spent your childhood? A combination of any of the above? If there are other users have account on your PC, one of them may access to it with the administrator level. If you failed to log on to your computer with the above way, you can call the administrator and ask him to change your password from within his account. The chances are you can't remember your password after guessing, or the password you lost is administrator one, the best choice is to use the Third party program to recover Windows 7 password. Whereas, there are a lot of Windows password crackers available, but we've found that Windows 7 password Recovery is the most effective. 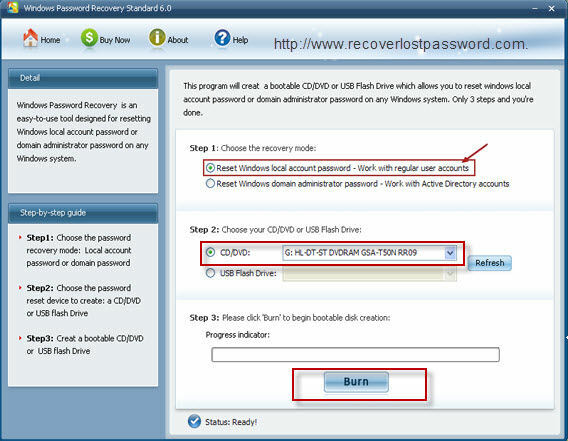 It is easy-to-use for computer novice to recover not only local account password but also other local administrator password. Step 1: Insert a blank CD or USB flash driver on a computer which can log in to Windows. 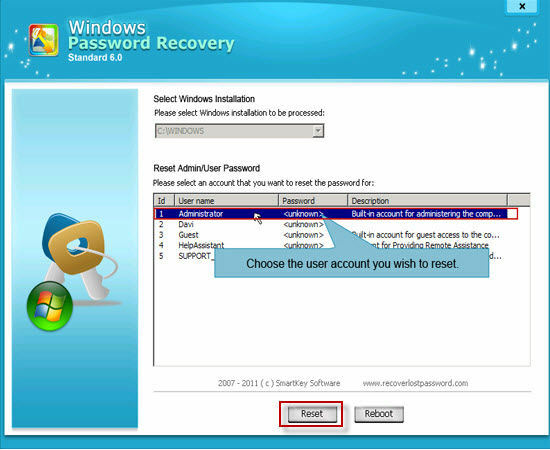 Launch Windows 7 Password Recovery Tool after you download and install it. Step 2: Specify "reset Windows local account password", and choose your target device from the drop-down menu. Note: Standard and Professional Version support to reset local account password, while Enterprise Version support Domain Administrator password reset if you have this requirement. Step 3: Click "Burn" to create bootable CD. Step 4: Insert this CD to the computer you would like to change password for, and boot it form CD. Step 5: Choose the system you want to reset password. Normally, one computer installs one system. Step 6: Highlight certain password and click "reset", and then click "Yes" & "OK" when two indicators appear. The password has been removed. Step 7: Reboot the computer to finish the reset. 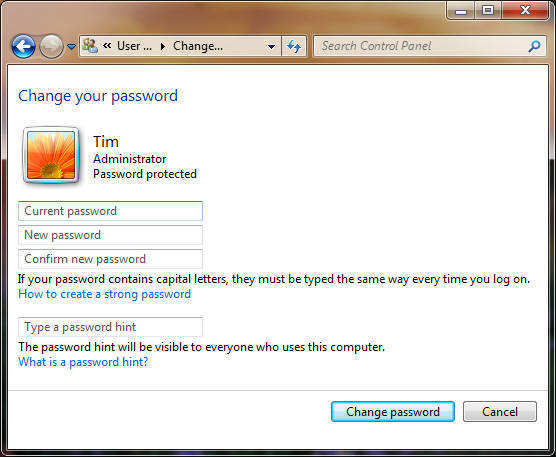 Never be afraid of recovering Windows 7 password again once you control the directions above. How to Bypass Administrator Password Windows 7? How to Change Account Password on Windows 7?